Straight talk mms not working – Complete Troubleshooting Guide. 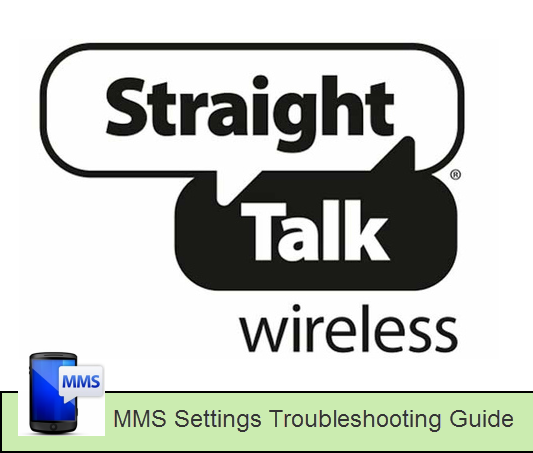 There are many folks out there that are having trouble with their Straight Talk MMS Settings, mainly not able to send or receive MMS on their Straight talk phone. This troubleshooting Guide is aimed at those guys who have already setup their Straight talk MMS Settings and are still not able to send or receive MMS on Android, if you are having this issue, please continue Reading, otherwise if you are looking into how to setup the MMS Settings for your phone, you should read THIS. A few things can cause the Straight Talk MMS not working issue, these Straight Talk MMS problems seems to be very common, especially when people switch from another operator or recently changing to an LTE phone. The most common reason causing the Straight Talk MMS not to work are related to wrong setup on the MMS Settings, either having the wrong configuration or missing the correct MMS Proxy or Port. Let’s get it done! Please verify that your phone actually have the proper Straight talk APN or MMS settings in Place. If you recently changed your Phone and you are using and old version of the SIM cards, sometimes this might be the problem. This is more relevant on the LTE Phones, and if you just recently ported your number from another operator, it might take a few days for it to replicate the settings over, in this case, just wait a little bit. If the above two steps doesn’t solve the issue and you are still not able to send, receive or Download MMS on your Straight Talk Phone, you can try downloading the GO SMS Pro APP, which seems to solve the issue for many people having this problem. This app also gives you additional features such as auto-reply, 800+ emotions and it’s completely Free. Please share your experience by leaving a comment below, if this article helped you solved the Straight Talk MMS Not working issue, please gives us a LIKE! I’ve tried everything at this point. Still cannot receive MMS messages. I can send them fine, just cant receive. I’ve read that some people are able to after the new service plan takes affect. Mine did today….still no luck on receiving MMS. This is very frustrating. I’m thinking I’ll give straight talk one more month before searching for another service. When I tested straight talk out for the first time on my AT&T SG3, all messaging and data worked perfectly, even receiving MMS. As soon as I ported my number over from verizon and switched SIMS, receiving MMS no longer works. I’ve spent a lot of time on the phone with straight talk customer service. All they can tell me is their canned answer of, “Sir, MMS working is a 50/50 chance with BYOP.” Then I say, “Can you explain to me why it worked with the original straight talk number I was given and the first SIM card, but not after I ported my number and switched SIMS?” Their response, “Sir, MMS working is 50/50 with BYOP.” UNACCEPTABLE!! Hi Jason, it’s really strange. did you have a chance to test this SIM in another phone? (perhaps you can borrow one and try?) did you try the app? It took more than a few days. It didn’t start working until 28 days later when I added a new months service plan. HI austin, what do you mean it will not save? what ahppens afer you type int he straight talk apn settings on the phone and hit save? did you create them from scratch? After trying 1 dozen times from 2 or 3 sites . . . and getting the same results as Austin and Becky . . . I have noticed that the setting in MNC (listed above as 410) in my phone was 260, and when I changed it to 410 as above, my phone would not save the setting- it just vanished. The last time I tried, I used the settings in the first example WITHOUT changing the 260 in MNC, and it DID save. Moments later I started receiving items from the past two days! Same here. When I save it, it never shows up! If I edit one thats already there, it vanishes! does the above work for any straight talk phone? Hi Coralee, it does work. are you still having trouble with text? I recently called straight talk about my sync not working.at first my apn was ATT MVNO after they troubleshooted my phone it says tfdata. Now I can’t download any mms but I can send. Those apn above didn’t work for my phone. What can I do so I don’t end up having to change service? I just switched from tmobile to straight talk today. Having the same problem can send mms but not receive. Tried the app still doesn’t work. Very frustrating. Any suggestions? Hi Lindal, sometimes it takes a few days for the settings to port over… is it working now? or you still have the issue? The settings are set for an AT&T sim card from Straight Talk. 5. If it doesn’t work try a new APN setting starting from Step 1. After everything else I tried, THIS is what worked for me. I had to click mms in the APN type area. Thanks so much! glad to know it worked for you Dude! I’ve tried so many different APNs and this finally worked after over a year not being able to use mms. StraightTalk gave me the same setting except the MMS Proxy was mms3.. When I put in the one with mms2 it worked! Thank you very much! HI Lauren, glad to know you have fixed your mss issues on straight talk! great to know Betty. Enjoy! Me too! Straight Talk gave me settings with a 3, and it did not work. When I changed it to a 2, it worked. Thanks so much! I can finally send AND receive photos. Hi Jan, glad to know it fixed your mms issue! THANK YOU SO MUCH!!! I have tried everything on every other forum. I don’t know exactly what part of your settings worked but I know all the others I tried did’t specify an APN type. Hi Katie, great to hear that you have fixed your text issue! Hi Celeste, Great to know that you had fixed your straight talk MMS issu now! OMG, this worked for me also. I loved my phone but was going to switch to another company because I couldn’t send pics. Thanks so much!!!!! I can enjoy my phone and straight now. This was very very helpful. I have a ATT Samsung Galaxy S6 on Straight talk. After trying everything I never could get my picture messages to work, until one day I found this website and seen your post. Thanks to you I can now receive and send picture messages. For everyone else to exactly what the post say do and your phone will work too. Hi Star, glad that our straight talk mms troubleshooting guide was useful 🙂 have a great date! Worked thank you you are the best. Hi Lou, great to know it did work for you! The only thing that worked for me as well. Tysvm. Hi Dawn, glad to know that you were able to fix your mmss issue! Hi Kim, on teh apn menu click en Delete. Thanks JB.NYC. Your instructions worked the first time I tried it. I haven’t had messaging for a looooong time! THANKS! Hey Roger, glad to know that this fixed your Straight Talk MMS issue! It worked I was amazed. I could just kiss you, thank you so much my problem solved. glad to know Kristie, so you werent able to send MMS before? Thanks JB. I have been fighting this problem on 3 phones and I have cauliflower ear from trying to get answers from customer service. Thanks for thinking of us other poor souls and helping us out too!!!! Hi Denise, glad to know if fixed your issue… which setting did you finally use? Thanks….It worked all I had to do was change my mms2 to mms3! Great Evan, so now you can send and recieve MMS? I’m having a similar problem, I had straight talk on my iPhone but my husband gave me his note 3 which is T-Mobile so I got a Sim card for the note 3 from straight talk. I tried activating it and putting in the new apn settings and I can call and send messages from the note 3 but I can’t receive calls or texts, I’m still receiving calls and texts thru my iPhone. What should I do? Hi Sunny, sometimes it takes a few days for the setting to port over. For the last week I have been getting only some messages on my iphone. For some people, they get my messages but I cannot receive theirs and for other people I have not gotten ANY of their messages but they got mine…this is not just mms messages either…it’s also doing this for sms. Then, this morning my phone delivered 20 messages from different days last week! Would this be a case to change the settings? This is NOT good to pay for service and NOT receive messages. I have an iPhone 6 with iOS 8.1 – I cannot modify APN settings. But I am unable to receive MMS from non-iPhones. iMessaging works fine. I can also SEND picture messages to Android phones. Just receiving doesn’t work. Regular texts work fine between any phones. Do you know what the current Straight Talk APN setting are? I am going to try doing the sim swap with the T-Mobile sim card. JB.NYC had the right fix for me. Had to have APN type on this phone a ZTE Max. Hi, which model of phone do you have? Thank you for your reply. I have a 3GS Apple iPhone. This is 100% related to whether you have the correct APN for T-Mobile or ATT. take a look at this article for more details. Thank you so much. Been pulling my hair out trying to figure out how to send and receive mms messages. This was great. Works perfectly now. Hey I just bought the new 9+, bought the multi starter pack for a nano sim card and used the At&t card. My old S5 got 5 bars sitting in my bedroom, and now my s9 gets 2 to 3 bars in the same location. any ideas? I thought the s9 was supposed to be better at wireless than the older ones, at least on par, not half the bars, or does this have to do with using the at&t card vs Verizon or sprint? Hi Philip, really strange… did this change on different locations? The only thing i could think of is maybe on the S5 you were using a 3G network over 4G? perhaps check that and see if that makes any difference. M y Iphone SE won’t MMS and there is no place to add these things you talk about. How can I do this and MMS? I just upgraded to this phone from my 5. Thanks so much! I am still having issues with MMS even after installing a messaging app. I have a galaxy S9 Verizon phone that has been switched over to straight talk. Everything seems to be working great except the MMS. The GoSms app worked and is very customizable, I like it and will continue to use it on my BLU studio 8LTE phone, thanks a bunch! Great Jay. is the normal MMS working for you as well?